This artist is quite rightly called the master of still lifes. Portraits of the master are in no way inferior to images of fruits, game and flowers. In the artist’s gallery there are landscapes, and even icons. In most still lifes can be traced frontal composition, where the centerpiece is a bouquet of lush garden flowers, eye-catching bright colors. All the details are very accurately written out and balanced. Still lifes attract colorfulness and a sense of celebration. The artist paints family scenes, the interiors of his estate, urban and rural landscapes, iconostasis for Uniate churches. The portraits of women and children are filled with warmth and that particular attention to detail, which make up the special atmosphere of the artist’s painting. In the painting “Portrait of a boy in a straw hat,” the master retains the compositional structure and color palette of still lifes. 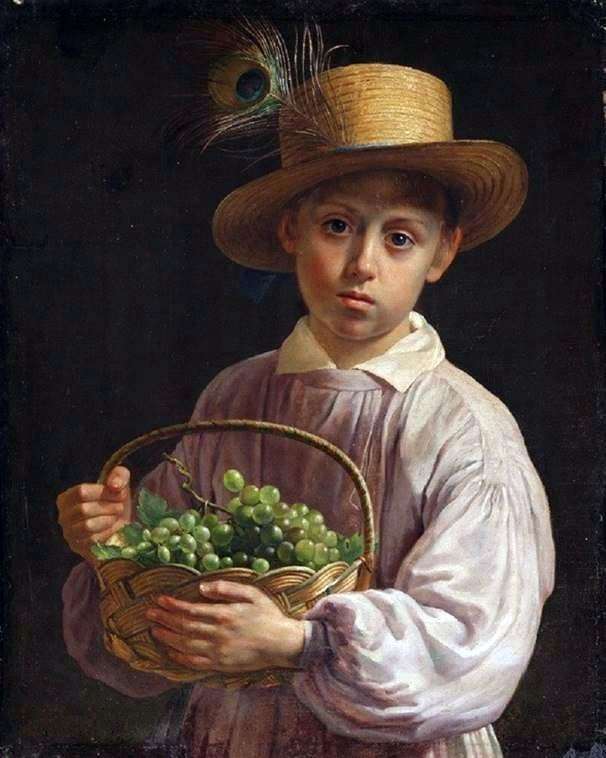 In the center of the composition is a boy with a basket of grapes. Each berry in the brush is written out brightly and naturalistic. Color shades emphasize the juiciness of the bunch. The boy pulled the basket to himself and calmly looked at us. A loose-fitting hat with a dandy feather slightly slid onto its side, revealing a touchingly pink ear tip. Partial lighting gives the image vividness and volume. A dark background allows all the attention to focus on the foreground. Dryness in detail drawing allows you to see each fold on the shirt and cuffs. There is no tension and special dynamic image. But the beauty of nature is reverently transmitted to the brush of grapes and in the face of a boy.